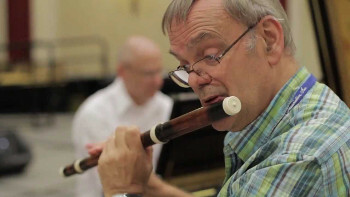 Born in Belgium in 1949, Kuijken began his conservatory studies on the modern flute in Bruges and Brussels, where he played with the Brussels-based contemporary ensemble Musiques Nouvelles. He discovered the baroque flute on his own while in conservatory in Brussels, using the numerous eighteenth-century treatises about the instrument as his guides and drawing inspiration from more general studies in the art, history, and literature of the period. He soon turned to the investigation of the instrument, examining such baroque flutes as could be found in museums and working closely with several instrument makers to create playable copies for performance. Kuijken has made further contributions to the advancement of the baroque flute by rediscovering and editing original seventeenth- and eighteenth-century repertoire for the instrument, including a newly annotated Urtext edition of J.S. Bach's flute compositions for the music publishers Breitkopf and Härtel. He is professor of baroque flute at the Royal Conservatories of Brussels and the Hague. In addition to playing in the baroque orchestra La Petite bande, Kuijken has an active touring schedule as both soloist and recitalist, with concerts taking him throughout Europe, North and South America, Japan, Australia and New Zealand, Israel, and Russia. Since 1986, he has also pursued his interests in conducting, with special emphasis on the vocal works of Johann Sebastian Bach.